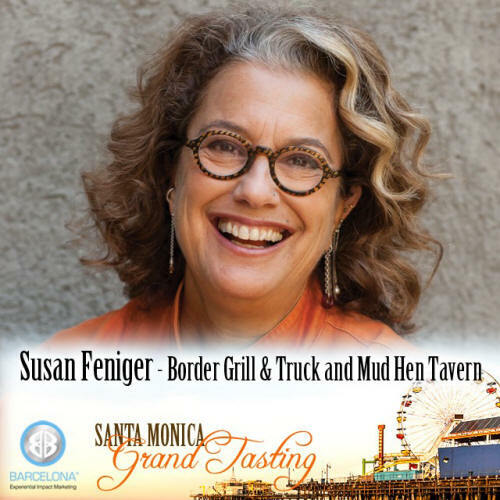 Susan Feniger is a celebrated chef, author, and entrepreneur. Her professional collaboration with Mary Sue Milliken (CITY, Ciudad, Too Hot Tamales) has led to the groundbreaking Border Grill empire, with locations in Santa Monica, Downtown LA, LAX Airport’s Tom Bradley International Terminal, Las Vegas at Mandalay Bay, and a second outpost in Las Vegas at The Forum Shops opened in October 2014. In 2013, Susan welcomed her new solo venture, the beloved Mud Hen Tavern in Hollywood. A classically trained graduate of the Culinary Institute of America, she was a trailblazer from the start, landing a job at Chicago’s famed Le Perroquet as one of the first women in the all-male kitchen. Following that, Feniger worked at Wolfgang Puck’s infamous Ma Maison in Los Angeles, and then further honed her culinary skills on the French Riviera. She opened City Café in 1981, which forever changed the culinary landscape of L.A. by offering eclectic dishes from around the world. This led to a much larger CITY restaurant in 1985, a pivotal year in which the tiny space was transformed into the first Border Grill, a “taco stand” serving authentic home cooking and street foods of Mexico. The strength of the brand also led to a line of prepared foods under the “Border Girls” name at Whole Food Markets, and the transformation of Ciudad (1998-2010) in downtown Los Angeles to encompass another Border Grill restaurant. In June 2013, Susan and Mary Sue were awarded the California Restaurant Association’s Elizabeth Burns Lifetime Achievement Award, joining the ranks of just a handful of other women who have made history in the restaurant industry. Most recently Susan and Mary Sue were inducted into the 2014 Menu Masters Hall of Fame. A natural teacher, Susan has co-authored six cookbooks, including her latest, Susan Feniger’s Street Food. Susan is a veteran of 396 episodes of The Food Network’s popular “Too Hot Tamales” and “Tamales World Tour” series and competed on Bravo’s “Top Chef Masters” in 2010. Susan shines a light on a number of worthwhile organizations and has been on the board of the Scleroderma Research Foundation for 18 years, the board of the L.A. LGBT Center for 4 years, and involved with Share our Strength and the Human Rights Campaign. She’s an active member of the culinary community, providing a leadership role in many organizations such as founding the Chefs Collaborative, sitting on the advisory board of the LA Sports & Entertainment Commission and serving as an active member of Women Chefs and Restaurateurs. At the core, Susan’s love of food shines through and is intermingled with her love of interaction with customers and staff. She still takes time to teach cooking classes and work the Border Grill booth at the Santa Monica Farmers’ Market as time and travel allows. Her days are spent in the kitchen, writing and testing recipes, creating menus, managing busy businesses, researching shows, and creating new products. Most nights, you can still find her visiting with guests and working with staff at Mud Hen Tavern and Border Grill. A culinary Expo with LA's top chefs. We are a Green Certified event by the Green Business Program.